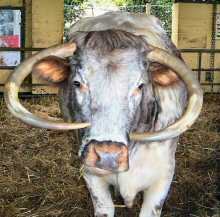 The Longhorn is regarded as the oldest pure breed of cattle in England. Its origin is obscure, but historically the breed was abundant, especially in the northern counties of England. It was also imported extensively into Ireland at an early period. 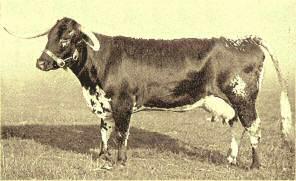 When Longhorns were no longer in demand as working animals, their numbers decreased rapidly as specialist beef breeds became more widespread. By the mid-twentieth century their numbers were dangerously reduced, but they have since been saved from extinction by the efforts of enthusiasts. They occur in small numbers in New Zealand. The Longhorn is a massive animal with a deep, long body. It is named for its extra-long, typically down-curving, horns. It comes in a variety of colours, often brindled or blotched, frequently with white on its legs, chest and flanks, and a characteristic white stripe or “finching” down its back. It should not be confused with the Texas Longhorn, which is a quite different, unrelated breed (see » Texas Longhorn).